I was up at 7am this morning and did the first of 2 writing sessions today. There were two scenes in Chapter 25 and I felt like between scenes was a good break point, especially since I had other chores to do this morning before our weekend guests arrived. Actually, there were not originally 2 scenes in Chapter 25 but the way I ended the first scene made the subsequent scene a natural fit to ratchet up the tension, and overall, I think it worked pretty well. I wrote 2,153 words today for a 26-day total of 56,333 words. 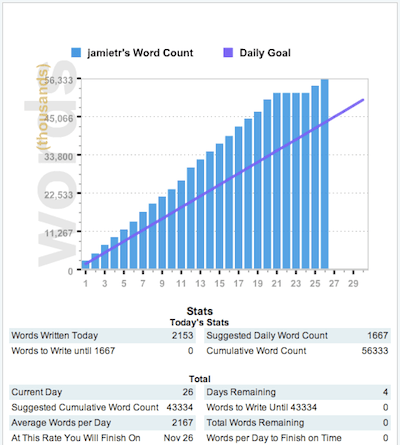 Despite my win on the 21st and missing 3 full days of writing, I am still more than 13,000 words ahead of pace, which is somehow pleasing to me. Glancing at my outline for Chapter 26, tomorrow should be a pretty fun day as well. Part 2 has a taken a turn from what I originally expected, and I imagine that this part will change the most in the second draft. But at least the changes have helped me push past the middle muddle and get back to my 2,000 words a day without much struggle.